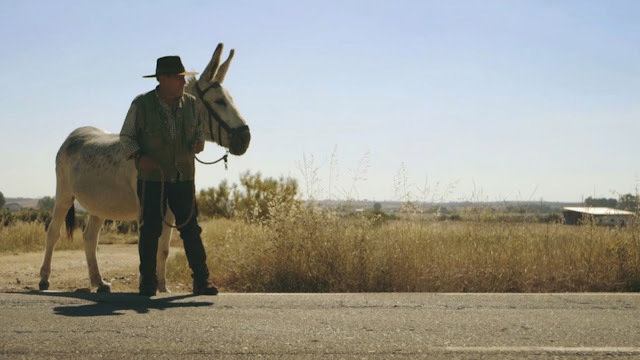 Manolo, 78-year-old errant knight (and Pereira’s uncle) sets out with his best friend, a donkey, Gorrión to take a long walk across Spain as a precursor to retracing the Trail of Tears. The man-donkey friendship is shown via shallow close-ups of the donkey’s grizzled chin as he nudges our man onward. Competing for Most Stubborn Rover they both suffer the consequences of a chase. The drunken reciting of ancient poetry in a Spanish shepherd’s dialect and the singing of a workers' song offset Western frontiersman tropes. Our picaresque crew at times becomes so displaced that we, by comparison, feel sorted. Tomorrow the Roxie hosts an enticing 16mm archival anomalies program presented by Craig Baldwin and screens the insane Nicholas Cage movie Vampire's Kiss; other upcoming bookings there include the SF Green Film Festival (including a 35th anniversary, 35mm screening of Wild Parrots of Telegraph Hill director Judy Irving's nuclear documentary Dark Circle), MiDNiTES FOR MANiACS screenings of Bring In On/Revenge of the Cheerleaders (the latter an amazing grindhouse gem with a screenplay by Nathaniel Dorksy), Blue Velvet/Peyton Place and The Fifth Element/Run Lola Run, a large David Lynch celebration, and much more. My first week or so at the San Francisco International Film Festival was pretty successful. I saw many solid movies, only one real dud (sorry, Golden Exits, it's you not me) and one absolutely gripping feature, Nocturama, that is really sticking with me and making me eagerly anticipate a chance to see it again (it's supposed to be commercially released theatrically in July, although I'm not sure if that's just in New York or not; no San Francisco dates have been announced yet.) I also really enjoyed the Who Cares, Who Sees: Experimental Shorts program although I feel a bit bad that I skipped out on the last short in the set (Jesse McLean's See a Dog, Hear a Dog) in order to race from the Roxie to the Castro for the transcendent Parallel Spaces: Bonnie ‘Prince’ Billy and Bitchin Bajas With Jerome Hiler program, which I hope to write more about soon as well. Here's hoping that the Crossroads festival coming to SFMOMA May 19-21 includes it in its program when it's announced tomorrow. 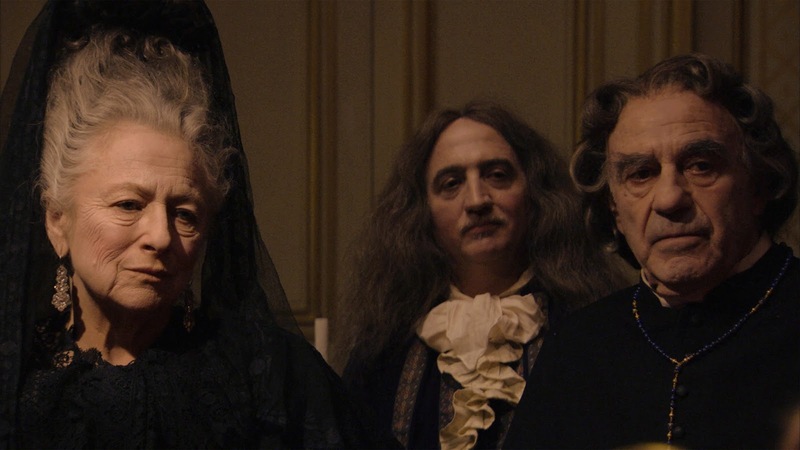 (In fact, I'd be happy to rewatch any of that program's films, especially Brigid McCaffrey's brilliantly-colored, hand-processed Bad mama, who cares or Christoph Gir​ardet & Matthias Müller's haunting personne in a future festival like Crossroads). None of the above-mentioned films has another SFFILM playdate; of the titles I saw that do, I was most impressed with the Catalan amnesia drama The Next Skin. One highlight of the weekend was the Sunday afternoon presentation of the Mel Novikoff Award, named for the former owner and/or operator of many historic Frisco cinemas (including the Castro), to former Pacific Film Archive director, Telluride Film Festival co-founder and co-director, and storied producer of films of all sorts, Tom Luddy. One of the great highlights of my blogging "career" was when Luddy responded by e-mail to my obituary of his friend and collaborator Chris Marker, and then allowed me to publish some of his recollections of working with Marker. Although I've never had the gumption to introduce myself to Luddy on the many occasions I've seen him at a local screening, I feel very much like a personal beneficiary of his famed generosity. Of course I also have greatly benefited from viewing films he had a hand in getting produced (like Jean-Luc Godard's Every Man For Himself and Godfrey Reggio's Koyaanisqatsi), or revived (like Mikhail Kalatozov's I Am Cuba and countless others). Alice Waters onstage at the Castro Theatre to introduce the Mel Novikoff Award presented by SFFILM to Tom Luddy, April 9, 2017. I just said that the award presentation was a highlight, but in fact that's not precisely true. The presentation of the spire-shaped award itself was unmemorable in itself. Luddy even left it on the table as he exited the Castro stage, which in the moment seemed to prove Michael Barker of Sony Pictures' Classics right when he said, "People like Tom Luddy do not seek awards. They go out of their way not to receive them," although I later learned that an in-fact grateful Luddy was asked to leave it behind by the festival staff so they could engrave it. Barker said this shortly after being brought out by the first speaker of the afternoon, SFFILM director Noah Cowan, who stressed that Luddy was in fact a member of the Mel Novikoff Award selection committee himself, and that his comrades in the group had "gone behind his back" to select him for the honor. Barker's encomium (followed by similar but not overlapping ones from Peter Becker of the Criterion Collection and Alice Waters of Chez Panisse) had competition from an attention-diverting slideshow of photographs of Luddy posing with various directors and other folks; I identified Les Blank, Wim Wenders, Philip Kaufman, Eleanor and Francis Ford Coppola (the latter three in attendance at the Castro as well) in one and Alexander Payne in another, while certain other figures were unrecognizable to me. However, his address was unfazed by audience members clapping for favorite pictures projected onto the screen above him, and he related how Andrei Tarkovsky told him Luddy speaks "perfect Russian," how Akira Kurosawa said of him upon disembarking from a long plane flight, "that guy plays a great game of golf," and how he'd personally been steered by Luddy to the works of Ozu, to Fritz Lang's Die Niebelungen, "the greatest war film ever made", and to the amazing 1912 silent The Land Beyond the Sunset. Becker, up next, credited Luddy with helping him appreciate and ultimately commit to restoring and releasing a pair of trilogies, Satyajit Ray's Apu and Marcel Pagnol's Marseille a.k.a. Fanny trilogy. Leah Garchik, reporting on the Castro event in the San Francisco Chronicle, has summarized Becker's tale of a Luddy-organized excursion he took with several aforementioned directors. Finally, Waters, just in from a Bloomington, Indiana screening of The Baker's Wife, talked of being brought by Luddy to Pagnol screenings at Novikoff's long-gone Surf Theatre and read a passage, from her upcoming memoir, about her introduction via Luddy to films by Kenneth Anger, Max Ophüls, Bruce Conner and Alain Resnais. For better or worse, this long build-up to the award presentation itself felt less like a public presentation and more like an intimate industry event than any Novikoff Award event I've attended (namely, Manny Farber in 2003, Paolo Cherchi Usai in 2004, Jim Hoberman in 2008, Serge Bromberg in 2011, Pierre Rissient in 2012 and Peter Von Bagh in 2013). The real highlight of the afternoon came after the statuette was delivered to its recipient and he expounded on his life as a cinephile-mover-and-shaker in an interview with critic Todd McCarthy. From a chair on the Castro stage (and magnified by video camera feed running above him), Luddy told stories from various stages of his life amidst screens and the artists who fill them. It didn't feel like name-dropping to me while hearing it, so I hope it doesn't seem like it when I try to summarize what he said. 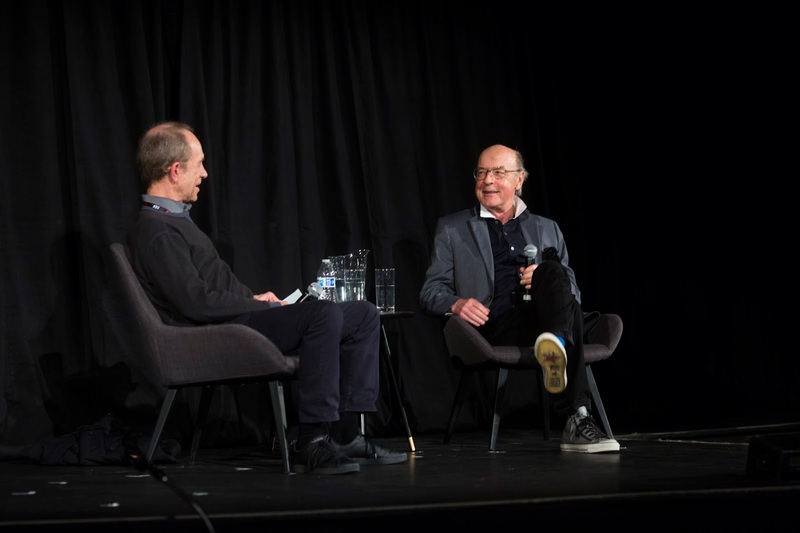 Film critic Todd McCarthy and Mel Novikoff Award recipient Tom Luddy onstage at the Castro Theatre during the 2017 SFFILM Festival, April 9, 2017. Luddy talked about the spark that ignited his movie passion: a high school religion class taught by a friend of Elia Kazan's, who took him on field trips to see The Ballad of a Soldier and films by Visconti, Bergman and the like at places like the Beekman and the Paris Theatre (although he later became delighted to realize he'd seen a Luis Buñuel film, namely Robinson Crusoe, at age 10). When he moved from New York to Berkeley he plugged right into the local cinema scene at a time when Sidney Peterson, James Broughton, Bruce Conner, Christopher MacLaine and Kenneth Anger were in the Bay Area. He attended screenings inspired by SFMOMA's Art in Cinema series which had been founded by Frank Stauffacher in the 1940s, such as Bruce Baillie's Canyon Cinema screenings "in churches in Kensington." He went to Ed Landberg's Cinema Guild just after Pauline Kael had been fired from it, sparking impassioned boycotts; he hadn't met Kael yet and thus had no loyalty to betray. Soon he was putting on shows himself, renting prints from local distributors like Willard Morrison's Audio Films and Bob Greensfelder of Kinesis, Incorporated (Greensfelder would later be instrumental with Luddy in helping Agnès Varda create her wonderful short Uncle Yanco.) Luddy ran Cal's F.W. Murnau Film Society (named for one of his longstanding favorite directors- and mine, too) and later, the Telegraph Repertory Cinema, which for a time brought in more box office revenue for screenings of Andy Warhol films than anywhere else in the country. 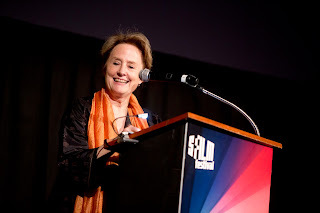 Asked by McCarthy about the San Francisco International Film Festival's early days, Luddy said "it was my film school." His first year attending was 1962, "when it was the only film festival in the Western Hemisphere." He fondly recalled Albert Johnson's afternoon tributes to key cinema figures and rattled off the line-up for just one year, 1965: "Walt Disney. Busby Berkeley. Gene Kelly. Hal Roach. John Ford. John Frankenheimer. King Vidor. Leo McCarey. Lewis Milestone. Mervyn LeRoy. William Wellman." A few other names from other festival years were tossed out by Luddy and McCarthy (who was also in the Bay Area by the late 1960s): Raoul Walsh, Jacques Tati, Bette Davis, William Wyler, and Rouben Mamoulian. And of course Howard Hawks, for whom Johnson had prepared such an extensive compilation of clips from throughout his career that the director was able to introduce the screening, head to Kezar Stadium to watch an entire 49ers football game, and be back in time for the post-montage interview. Tom Luddy, recipient of the Mel Novikoff Award presented by SFFILM. April 9, 2017. Eventually Luddy became director of the Pacific Film Archive, and from that position co-founded Telluride, to where he was particularly proud of bringing an array of guests without perhaps the name recognition of Johnson's cohort, but whose cinematic contributions arguably stand as high: he listed Dusan Makavajev, Kenneth Anger, Stan Brakhage and Francis Ford Coppola, and legendary art directors Ben Carré and Alexander Trauner. Most especially, Napoléon director Abel Gance, who at nearly ninety remarked, according to Luddy, "I'd rather die on my way to Colorado than vegetate in this cottage" when he offered to bring him there from Nice. Also cinematographer John Alton, a long-standing "holy grail" for the Telluride team to bring, and who was finally tracked down at age 92 after decades living abroad. 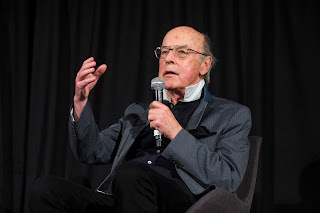 Luddy said he left his position at the Pacific Film Archive due to frustrations with the University bureaucracy at the time; he gave one example of being left on the hook for expenses, that ought to have been paid by the school, from Jean-Luc Godard's visit to the institution. By then he'd struck up a friendship with Francis Ford Coppola, who welcomed him into the fold at his American Zoetrope with open arms. Together with George Lucas, they helped secure backing from 20th Century Fox for Akira Kurosawa's 1979 film Kagemusha, after a shared meal at Chez Panisse in which the elder master explained how he couldn't find enough funding in Japan, and the younger three couldn't help but notice the scars from his 1971 suicide attempt on his hands. After Luddy presented Gance's Napoléon at the Avenue Theatre with Bob Vaughn performing an organ accompaniment, Coppola was inspired to try to present it at Radio City Music Hall with "a symphony" by his father Carmine Coppola as accompaniment. Luddy helped make that happen, too, and went on to produce Mishima: a Life in Four Chapters with Paul Schrader, Barfly with Barbet Schroeder and Wind with Carroll Ballard. Those are just a few of the titles he highlighted from the Castro stage! 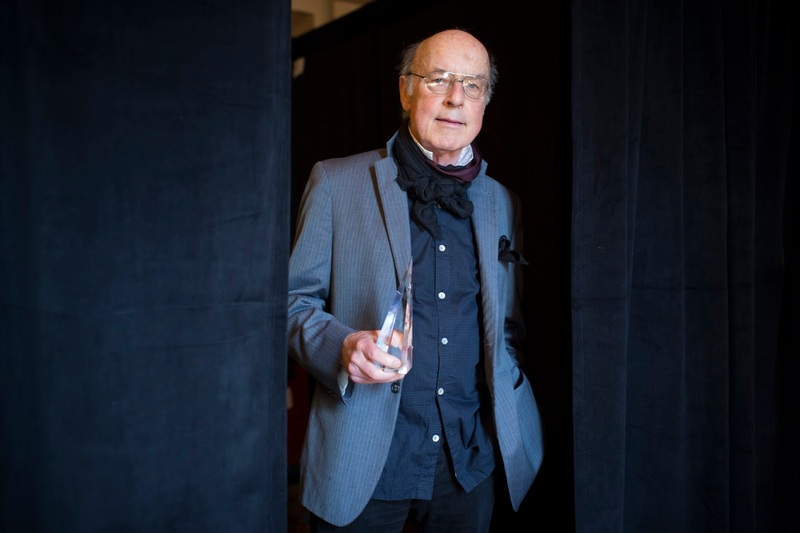 Tom Luddy, recipient of the Mel Novikoff Award presented by SFFILM onstage at the Castro Theatre, April 9, 2017. Meanwhile, in 1979 Luddy was called in by San Francisco International Film Festival director Claude Jarman to help shepherd the festival when he no longer wanted to remain. At that time in festival history, this meant taking on the responsibility of $150,000 worth of debt. Luddy agreed to volunteer his time to help keep the festival alive through this period, but only if Mel Novikoff would join him in the responsibility. Novikoff agreed and allowed the festivals to use some of his theatre screens without a rental fee for a time, until George Gund stepped in and saved the festival from its debts. Luddy said that working at the non-profit Telluride Film Festival at the same time as working as a producer in the for-profit movie business is part of the reason why he kept a fairly low-profile through those years, refusing interviews in order to avoid drawing attention to his unique, and perhaps to some, questionable, position. But looking at what he was able to build by straddling both sides of the non-profit/for-profit line, it's hard to begrudge his dual devotions. The films he chose to screen after the discussion represented these two sides of Luddy pretty well. First, we saw Une Bonne à Tout Faire, a brief piece made by Jean-Luc Godard on the incredible Dean Tavoularis-designed casino set of the American Zoetrope production One From the Heart. Intended as a test for his 1982 film Passion, Godard creates a luminous tableau quite reminiscent of some of the most memorable shots in that film, turning a real film production site into an imaginary one in which Andrei Konchalovsky, portraying a director, and Vittorio Storaro, portraying a cinematographer, communicate with each other in un-subtitled Russian and Italian, respectively, as if locked in a Las Vegas Tower of Babel. Though it was never released at the time, Godard sent Luddy this digital version of the short, transferred from the 1-light dailies for a 2006 screening at the Pompidou. The film's actual cinematographer Ed Lachman (La Soufrière, Carol) is on the hunt for the original negative materials so a preservation (and, I would hope, release) print can be struck, but in the meantime what we saw looked pretty darn good. The digital presentation of Soviet filmmaker Gennady Shpalikov's A Long and Happy Life, however, didn't fare as well. Though there clearly is a beautiful, equally Jean Vigo- and Michaelangelo Antonioni-influenced film in there somewhere, it was hard to fully appreciate it through the low-contrast, cloudy image quality that appeared to be not much better than the version currently viewable on YouTube. I heard through the grapevine that there was originally a plan to screen a 35mm print from the BAMPFA collection (thus connecting this choice directly to Luddy's non-profit career), but that it was found to be unsubtitled and thus a digital substitute was made. This seems like the perfect opportunity to bring in digital soft-titles over a 35mm print, as has been undertaken at the Noir City festival, for instance. For whatever reason, SFFILM and its partners decided against this option. Though both films screened as DCP, Luddy himself is clearly for the use of 35mm prints when possible. Before introducing the screening, and after listing a few all-time favorite filmmakers at McCarthy's behest (including Julien Duvivier, Sergei Eisenstein, Vsevolod Pudovkin, Alexander Dovzhenko, Mikio Naruse, and Kenji Mizoguchi, as well Murnau, Ray, Bergman, Godard and Coppola) he expressed appreciation for Bay Area audiences and presenters. 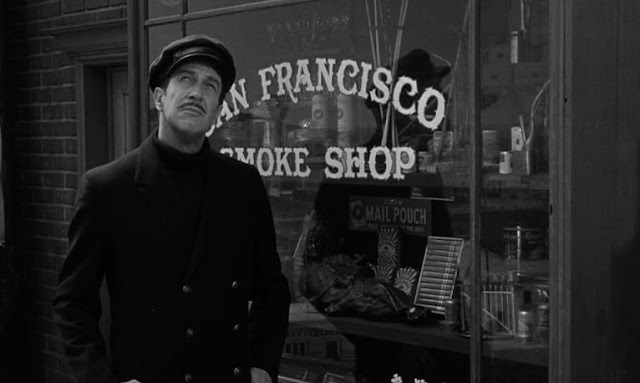 He singled out the San Francisco Silent Film Festival (which has recently announced its June slate, by the way), for being able to "fill this theater for relatively obscure silent films," as well as Noir City and the completely-non-digital Stanford Theatre. He noted that his friend, critic David Thomson, was helping prepare a summer program tribute to the Warner Brothers studio, stressing that David Packard would be striking new 35mm prints of certain titles currently unavailable to show in that format. Obviously the series will probably include plenty of well-known titles like the Adventures of Robin Hood, The Jazz Singer and Mildred Pierce but my mind is still racing imagining all the possible rarities I might finally be able to see in their intended format this summer. Rarities by Walsh? Hawks? Wellman? Frank Borzage? One Way Passage? Thunder Over the Plains? The Blue Gardenia? Perhaps even the namesake for this blog? I'm trying not to raise my expectations too high. Goodbye SFIFF. *sniff* Hello SFFILM! The San Francisco International Film Festival, while celebrating its 60th iteration, is undergoing a major rebranding. As Michael Hawley points out in his March 24 festival preview piece, we saw "hints of impending change in some of the graphics used during last year's festival and now it's become official. Henceforth, the festival's parent organization, the San Francisco Film Society, will be officially known as SFFILM, and the preferred name for its annual festival is the SFFILM Festival." Hawley's been attending since 1976, 23 years longer than I have, so he's seen more dramatic changes over the years (like when it moved from October to April in the early eighties); what I've seen over the past eighteen has generally felt more like natural evolutions and minor tweaks by comparison. But there are bigger changes for this 60th annual festival than just the name-change. The festival's timing has been moved up fifteen days from the slot in the calendar it had occupied since I started attending in 1999. On an international scale, this gives SFFILM more breathing room before the beginning of Cannes in mid-May. 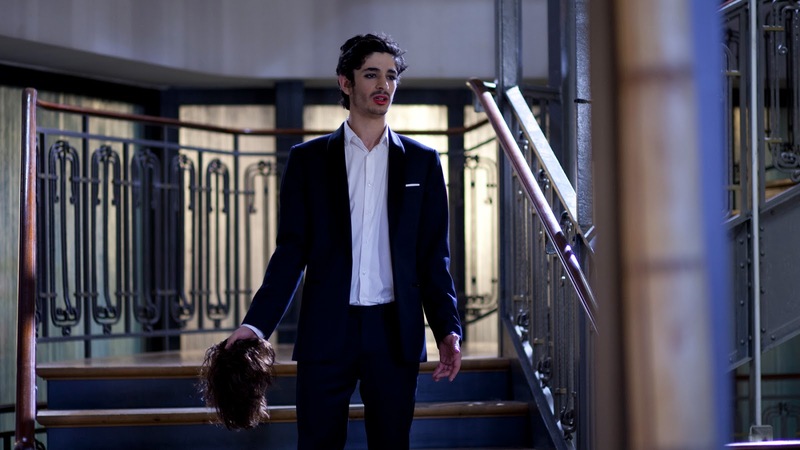 Nationally, it bumps it up to before Tribeca, which has in some previous years proved a thorn in The Festival's side in terms of booking all the films and guests it might have wanted to bring in a perfect world. Locally, the move has already caused some other festivals to shuffle their dates. (Certainly the Green Film Fest, probably SF Cinematheque's Crossroads too, and I can't help but wonder if CAAMFest's recent announcement that it's moving its traditionally-March-held event to Asian Pacific American Heritage Month for 2018 is partially spurred on by an expectation that SFFILM would be permanently vacating May.) Starting and ending the festival on Wednesdays feels rather earth-shattering in a town in which almost every film festival begins on a Thursday or Friday and ends on a Sunday or Thursday. If it's successful, will this move also be copied by the myriad of other local fests? More regular screening venues have been commandeered than ever (at least in my memory) including, for the first time, my beloved (closest to my home and to my workplace of all festival venues) Yerba Buena Center For the Arts, which will utilize its normal 92-seat Screening Room and outfit its 700+ seat Theatre, normally used for live performances and lectures, with DCP projectors. I'm excited to check out a movie or two in a space I never have before. That goes double for the Dolby Cinema space at 1275 Market, which opened for private demonstrations and press screenings last Fall but as far as I know hasn't been available to the ticket-buying public until now; it'll be used only during SFFILM's first weekend. A good number of screenings there are already at RUSH status so if you want to see the space buy your tickets soon if you'd rather not wait in line for a chance at an emptied seat. With the addition of these new spaces, pretty much all of my favorite San Francisco cinemas are being used, the few exceptions being Artists' Television Access (and Craig Baldwin's Other Cinema-within-a-cinema, which brings two programs during SFFILM), and the sporadically-used New People, which is hosting an all-digital Cherry Blossom Film Festival in the second year in a row of the San Francisco International Film Festival's absence from Japantown). Add in BAMPFA in Berkeley as another major venue for ten days, and there's not many options (mainly just the Stanford, which is running a Val Lewton retrospective this month, and the Niles Film Museum) for Frisco Bay cinephiles wanting to attend non-commercial screenings outside The Festival's purview while it's happening. I'm especially pleased that the Castro Theatre is being utilized daily for 12 of the 15 festival days, not just for certain high-profile events like tonight's opening night selection Landline or the amazing-sounding closing night The Green Fog on April 16th (which in this case celebrates the closing of some venues but not others, as screenings continue at the Mission venues the Roxie, Victoria & Alamo for a few days after that), as it usually has been over the past decade-plus. Which brings me to the other major change I notice in this year's festival: awards presentations. When I first started attending, the San Francisco International Film Festival presented four major awards to cinematic luminaries in four distinct categories. The Akira Kurosawa Award for directing had at that point gone to world cinema titans such as Kurosawa, Robert Bresson, Satyajit Ray, Ousmane Sembène, Manoel de Oliveira, and Im Kwon-Taek, as well as a few genuine Hollywood legends like Arthur Penn and Stanley Donen. Shortly after I began paying attention the awardees began a sixteen-year streak of being either American or else having each directed major English-language hit films. (During this time the award's name changed to the Irving M. Levin Award, after The Festival's 1957 founder.) The vast majority of these more recent awardees were perfectly solid and sometimes inspired choices, but only a few (like Robert Altman and Werner Herzog) tapped into my cinephile pleasure centers as deeply as I might hope, and as a group, even with a Walter Salles here and a Mira Nair there, they didn't feel like they truly embodied the "International" in the festival's name. At least the selections were more diverse than the recipients of the Peter J. Owens Award for acting over the years. Again it's a very solid list of stars who have proved (and in a few cases, later disproved) their serious commitment to acting, but as a group it's all white, mostly male, and nearly all American with only a couple Brits and one Australian to justify the "International" label. By contrast I could rarely quibble with the choice of recipients for the Persistence of Vision Award to directors of animation, documentary, short-form and/or experimental work or the Mel Novikoff Award presented to individuals or institutions (most commonly critics, programmers, distributors, or archivists) whose work has "enhanced the filmgoing public’s knowledge and appreciation of world cinema," both of which have done an excellent job alternating between honoring already-beloved figures and bringing attention to lesser-known but equally vital contributors to a thriving cinephile culture. I have wonderful memories of attending, often at the Castro Theatre, the public conversations with recipients of each of these four awards, as well as with more recent addition Kanbar Award for screenwriting (notably Paul Schrader's 2015 presentation, though he spoke more about his work as a director and they screened his astonishing Mishima: a Life in Four Chapters, which feels to me more like a director's than writer's achievement.) But I've long assumed that the forces guiding these awardee selections, at least for the Levin, Owens & Kanbar Awards, had their eyes less on these for-the-general-public events and more on the annual Film Society Awards Night black-tie gala events that cost to attend, at minimum, as much as some of the cash prizes for Golden Gate Awards Jury Prize winners. I'd never had anyone who didn't work for the festival admit to me they'd attended these tony affairs, and plopping it in the middle of a two-week cinephile event always felt like a weird disconnect. The disconnect grew a bit wider in the past few years with the addition of a new honor, the George Gund III Craft of Cinema Award, given under apparently rather vague criteria to worthy cinema-related luminaries such as Peter Coyote and Ray Dolby, but with no affordable public program attached. Obviously nonprofit fundraising is important, and if celebrity appearances help grease the wheels so that an organization like SFFILM can fulfill its mission to help foster film culture, I'm not going to dismiss its importance. But there are signs that in the most recent chunk of the San Francisco International Film Festival's six-decade lifespan, it's become overly-important, perhaps even to the detriment of The Festival's public programs. (Did you ever notice one mid-fest night in which the films and guests on offer seemed a bit lackluster in comparison to every other? That was probably the Film Society Awards Night; most of the top-level festival staff was preoccupied with that event and so other programs that night sometimes tended to be easier-to-introduce, guest-free ones). So I'm really quite happy to hear that this year SFFILM will be moving its gala fundraiser to the Fall (no doubt to coincide with "Awards season") and, if I understand it correctly, taking the Levin, Owens and Kanbar Awards with it. It doesn't mean there aren't plenty of awards and tributes planned for the next few weeks; it just means they've all been arranged with an eye exclusively to the public presentation and not in selling multi-thousand-dollar tables to a fancy dinner. The Mel Novikoff Award is going to a long-overdue local recipient, Tom Luddy, a storied figure in Frisco Bay and indeed international cinephilia, whose accomplishments have partially been recorded by Michael Fox in a recent article. I'm excited to see his screening selections A Long Happy Life (a 1966 Soviet drama I'd never heard of before) and the eight-minute-long Une Bonne à Tout Faire, which must be one of the least-commonly seen things ever directed by Jean-Luc Godard, and to hear his conversation with Todd McCarthy at the Castro this Sunday. The P.O.V. Award will go to Lynn Hersman Leeson, another local with a long history in moving-image art going at least as far back as her involvement in the Maysles Brothers' and Charlotte Zwerin's wonderful 1977 documentary Running Fence. And for the first time the George Gund III Craft of Cinema Award will presented at a public event, this time to Eleanor Coppola at an already-RUSH-status screening of her new Paris Can Wait at SFMOMA. Hopefully we'll soon have a clearer picture about just what this award is for. In addition, The Festival has arranged tributes to philanthropist Gordon Gund, writer/producer/director John Ridley, director/writer/producer James Ivory, actor/writer/director Ethan Hawke and actor/producer Shah Rukh Khan. The others are solid choices but I'm thrilled by this last pick: the biggest movie star in the world will be on hand at the Castro, hopefully to launch a series of annual international star tributes, and the film they're showing is a Bollywood-goes-to-Frisco Bay mini-epic (less than three hours is short for an Indian hit) I've been wanting to see for a while: My Name is Khan. The only way it could be better is if they were instead showing his 1993 film that shares my name: Darr. (I learned about it from a festival volunteer over a decade ago.) Surprisingly, there are still tickets available for this. Of course the soul of the San Francisco International Film Festival is not found so much in the awards and tributes but in the hundred and eighty or so films being screened over the next fifteen days. Be sure to peruse the surfeit of links collected by David Hudson at Keyframe Daily; I'm particularly partial to the advice of trusted friends Max Goldberg and (again, with a more recently published piece) Michael Hawley, who are helping me guide my own viewing selections along with unmentioned-on-Keyframe articles by Kelly Vance and Lincoln Spector. I'd also be remiss not to mention the Bay Area Film Calendar, which notes which of the SFFILM presentations will involve actual reels of film. 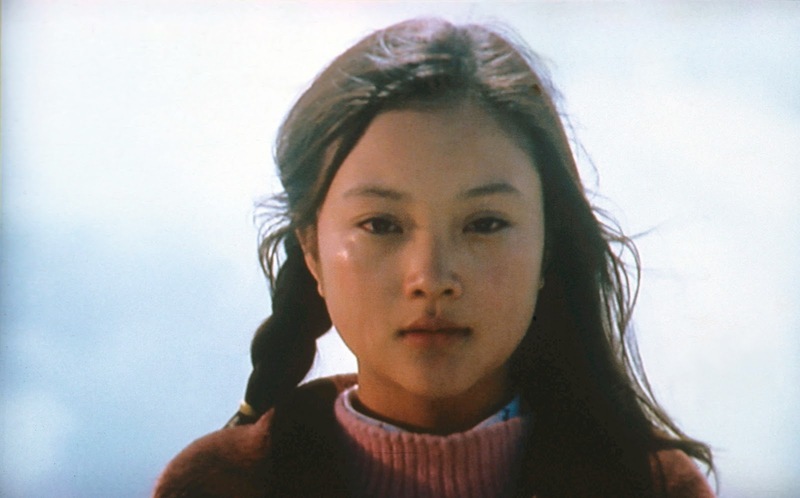 For the record, it's four programs (one repeated): Joan Chen in person with a 35mm print of her directorial debut (which stunned me on first release; time for a revisit?) Xiu Xiu: the Sent-Down Girl, 16mm presentations of Jerome Hiler films and Guy Maddin's personal selections from the Canyon Cinema catalog, and the only new 35mm film in the program, a 12-minute short by Brigid McCaffrey called Bad mama, who cares, which plays alongside work by Janie Geiser, Matthias Müller and other experimentalists in the Who Cares, Who Sees shorts program. It's a shame this program's only San Francisco showing is nearly at the same time as the Hiler program; those of us who want to see every last scrap of physical film projected at The Festival will either have to give up a prime Saturday night slot to see Bad mama, who cares at BAMPFA, or try our hardest to race from the Roxie to the Castro in hopes of catching both on the same Monday.